Proprietary Name: Lubricant Eye Drops What is the Proprietary Name? Non-Proprietary Name: Carboxymethylcellulose Sodium What is the Non-Proprietary Name? 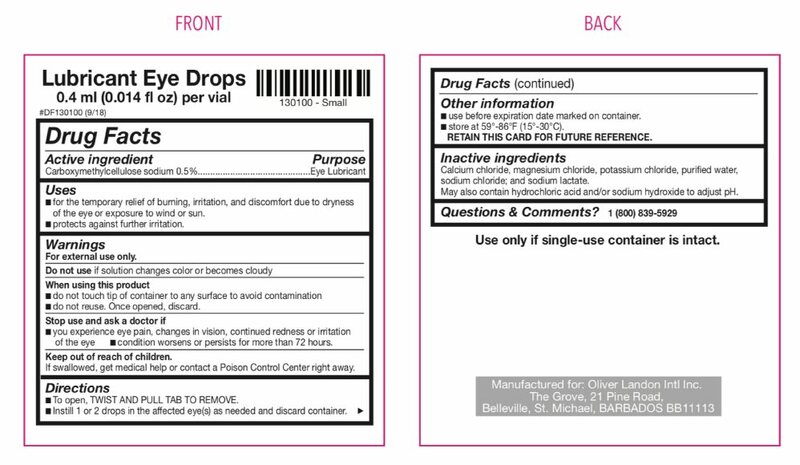 59276 - Oliver Landon Intl Inc.
Lubricant Eye Drops with NDC 59276-905 is a a human over the counter drug product labeled by Oliver Landon Intl Inc.. The generic name of Lubricant Eye Drops is carboxymethylcellulose sodium. The product's dosage form is solution/ drops and is administered via ophthalmic form. Labeler Name: Oliver Landon Intl Inc.
FDA Application Number: part349 What is the FDA Application Number? ▪for the temporary relief of burning, irritation and discomfort due to dryness of the eye or exposure to wind or sun.▪protects against further irritation. For external use onlyDo not use if solution changes color or becomes cloudyWhen using this product▪do not touch tip of container to any surface to avoid contamination.▪do not reuse. Once opened, discard. •you experience eye pain, changes in vision, continued redness or irritation of the eye •condition worsens or persists for more than 72 hours. •To open, TWIST AND PULL TAB TO REMOVE. •Instill 1 or 2 drops in the affected eye(s) as needed and discard container. *If used for post-operative dryness and discomfort, follow your eye doctor’s instructions. ▪use before expiration date marked on container.▪store at 59°-86°F (15°-33°C)RETAIN THIS CARD FOR FUTURE REFERENCE.Use only if single-use container is intact. Calcium chloride, magnesium chloride, potassium chloride, purified water, sodium chloride and sodium lactate. May also contain hydrochloric acid and/or sodium hydroxide to adjust pH.